1996: Kerri-Anne Kennerley made the successful transition from breakfast TV to revive The Midday Show. She continued to host Midday for three years. The decade started in recession and with two networks in receivership, and a third being sold back to its former owner for a fraction of what it had been bought for. Cost cutting and tight budgets became increasingly common. Despite this, regional television was expanding at a rapid rate to give country viewers the same choices as their city counterparts. Then came the countdown to the new millennium. January: The 1990 Commonwealth Games in Auckland, New Zealand are televised on Nine. February: Steve Vizard’s Tonight Live begins on Seven. Ten launches two spin-offs from The Comedy Company — Larger Than Life with Mark Mitchell and the sitcom Col’n Carpenter. The Seven and Ten networks go into receivership. Kerry Packer’s PBL purchases the Nine Network stations in Sydney, Melbourne and Brisbane back from Alan Bond for $A200 million — a fifth of what Bond paid PBL for them in 1987. June: Corporate sponsorship of SBS’ coverage of the FIFA World Cup is the precursor to limited advertising content appearing on the network. July 15: After a six month absence, The Comedy Company returns on Ten but fails to repeat the success of its earlier seasons. December 31: Queensland becomes the second Aggregated market with local stations Sunshine Television (now Seven Queensland), WIN and QTV (now Southern Cross Nine). January: Nine’s latest attempt at popular drama, Chances, begins a two year run, while Ten revives the axed Perfect Match under the title Blind Date. The Gulf War sparks saturation television coverage. April: Glenn Ridge and Jo Bailey replace Tony Barber and Alyce Platt on Sale Of The Century. August 5: US talk show The Oprah Winfrey Show makes its debut as a late-night program on Network Ten. December 31: Aggregation arrives in Northern NSW with local networks Prime, NBN and NRTV (now WIN) now in competition across the entire region. January 1: Aggregation arrives in regional Victoria with local commercial networks Prime, VICTV (now WIN) and Southern Cross Network (now Southern Cross Nine). January 20: Ten Eyewitness News becomes the first 5pm news service, and Bert Newton returns to television as host of Ten’s new The Morning Show. January: Former ABC reporter Stan Grant fronts Seven’s new nightly current affairs program, Real Life. February: Healthy Wealthy And Wise begins a seven-year run on Ten. July 18:The Late Show with the D Generation starts on ABC, running for two seasons. January 11: Tony Barber’s Jeopardy begins a brief run on Ten. February 1: Ten’s The Morning Show adopts the title Good Morning Australia, taking the name from the network’s former long-running breakfast TV program. August 30: Ten’s late night sports round-up Sports Tonight begins. November 22: A Country Practice screens for the last time on Seven, to be picked up by Ten for a brief run in 1994. January 18: Seven premieres its new rural police drama Blue Heelers. February: Ten launches its new schoolroom drama Heartbreak High, a spin-off of the movie The Heartbreak Kid, and Derryn Hinch takes over from Ray Martin as host of Nine’s Midday. April 30: Aggregation of commercial television services is completed in Tasmania with TAS TV (now WIN) and Southern Cross Television broadcasting statewide. May 9: Frontline, a satirical look at current affairs television from the D Generation, begins on ABC. August 1: Melbourne’s ATV10 celebrates 30 years of transmission. August: The Commonwealth Games are televised live on Ten from Victoria, Canada. Community Television starts with long-term trials of stations in Melbourne, Sydney, Brisbane, Adelaide and Perth. January 1: Pay TV commences in Australia with Galaxy launching its first channel, Premier Sports Network, in Sydney and Melbourne. January 30: Today Tonight launches on Seven with individual editions in each of Sydney, Melbourne, Brisbane, Adelaide and Perth. January: Southern Cross Broadcasting, owner of Ten Victoria and Southern Cross Network in Tasmania, purchases Canberra-based Capital Television for $40 million. February: The Seven Network secures TV broadcast rights to the Atlanta (1996) and Sydney (2000) Olympic Games for around $A100 million. Seven premieres its new drama series Fire, and Nine’s series of Halifax fp telemovies continue to earn strong ratings. Optusvision (September) and Foxtel (October) join Galaxy as new pay TV providers. Australian television celebrates 40 years with commemorative specials on ABC, Seven, Nine and Ten networks. Nine premieres its new action drama series Water Rats and relaunches Midday with new host Kerri-Anne Kennerley. Nine launches a new version of In Melbourne Tonight hosted by Frankie J Holden with Denise Drysdale. Screening once a week in Victoria, South Australia and Western Australia, it is axed two years later. Two years after its US premiere, the first series of Friends screens on Seven, with subsequent series screening on Nine. The Sydney Gay and Lesbian Mardi Gras is televised for the first time on commercial television. July 1: Prime Television expands to Mildura in regional Victoria. September 6: The funeral of Princess Diana is televised live on all ABC and commercial free-to-air television stations. December: South Park, the politically incorrect animated series from America’s Comedy Central pay-TV channel, begins on SBS and becomes the network’s highest rating series to date. February 18: The Panel, from Working Dog Productions (formerly the D Generation), begins on Ten. February 24: Seven’s hospital drama All Saints begins. March 27: Darwin’s second commercial television station, Seven Darwin, commences transmission. Midday is axed by Nine, ending a daytime TV tradition that started in 1973. Seachange, ABC’s new weekly drama starring Sigrid Thornton, becomes a huge hit on Sunday nights. The two-part mini series The Day Of The Roses, based on the 1977 Granville train disaster, screens on Ten. ABC’s popular Good News Week moves across to Ten. The second season of Seachange achieves record ratings for ABC. WIN expands into regional Western Australia as the second local commercial TV broadcaster, up against former monopoly broadcaster GWN. Aggregation between Imparja Television (Northern Territory/South Australia) and Seven Central (outback Queensland) commences, giving outback viewers a choice of two commercial TV networks. 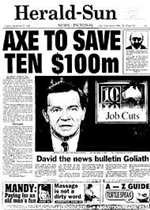 May 28: National morning news program Eleven AM is axed by Seven after 24 years. Jana Wendt becomes presenter of Dateline on SBS. Seven begins transmitting its logo watermark on all programs. Millennium fever begins with tribute programs from Nine (Our Century and Simply The Best), Seven (a remake of the 1979 series This Fabulous Century) and ABC (Barry Humphries’ Flashbacks). November 20: Nine’s Hey Hey It’s Saturday ends after 28 years on air, ending a forty year tradition of live television variety from GTV9. December 31: ABC is the host Australian broadcaster of the international TV event 2000 Today, a 26-hour live telecast of new year celebrations around the world, commencing at 8.30pm (AEDST) on 31 December. Aggregated markets…..Ugh!!! Aggregation has been the ruin of regional TV in Australia, just as the stations themselves have correctly foretold. Regional broadcasters have lost their local identities in all but only a few exceptions. And where is the ACMA while all this is happening? Cowering under its blanket, too scared to come out and do the job it was put there to do – regulate broadcasting! in reply to Neil Forbes to clear things up Radio and TV stations have the primary responsibility for ensuring that the material they broadcast meets community standards. Most aspects of program content are governed by codes of practice developed by industry groups representing the various broadcasting sectors. The ACMA registers codes once it is satisfied that broadcasters have undertaken public consultation and the codes contain appropriate community safeguards. Some aspects of broadcasting are subject to licence conditions set out in the Broadcasting Services Act 1992. For example, commercial, community and other radio and television stations are subject to a licence condition prohibiting them from broadcasting tobacco advertisements. Australian content and children’s programs on commercial television are regulated by compulsory program standards determined by the ACMA following consultation with the industry and the public. The ACMA has also determined further program standards and licence conditions dealing with particular issues. For example, commercial radio broadcasters are subject to standards requiring the disclosure of commercial agreements with the potential to affect the content of current affairs programs. The ACMA monitors matters relating to some standards and licence conditions and investigates complaints about them from the public. The ACMA also acts as an independent adjudicator where complaints about matters relating to codes of practice, including the ABC and SBS codes of practice, are not resolved between the complainant and the broadcaster concerned. If the ACMA finds a breach of a code of practice, licence condition or standard, it may take enforcement action to ensure future compliance. Galaxy launched on Thursday, January 26 1995, with two channels, Prime Sports Network (later to become Premier Sports Network) and ANBC (later to become CNBC). Movie channels Showtime and Encore were added in March. They closed a year or two later due to bankruptcy. Foxtel officially launched on Monday, October 23 1995, a week earlier than originally announced. Optus Vision launched before Foxtel, maybe in September 1995, with a launch event featuring Bruce Gyngell saying “Good Evening and Welcome to Cable Television”, a reference to his opening comments on television in 1956.